For weeks (or maybe even months), you’ve been regaling your boss with the many benefits of remote work. But as much as you’ve been trying to get him to adopt a more flexible work mindset, he’s still stuck in traditional office operating mode. 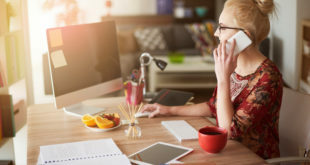 If you’re itching to work from home, these three tips for convincing your company’s leadership to embrace flexible work options just might, well, work. If you want your boss to adopt a flexible work policy (and get out of the office and into your home office), you’ll need to present him with facts and figures about remote work to prove your case. And case in point: it’s estimated that 50 percent (yes, half) of the U.S. workforce will be working remotely by 2020. That’s just four short years away. And that doesn’t even begin to include the legions of people who want to work from home. A report by Chess Media Group found that a staggering 90 percent of workers see an organization that offers flexible work options as more attractive than those that don’t. That means the top-tier talent you want to recruit will go to your competitor…who just happens to have a flexible work policy in place. Sure, you brought all the stats out about flexible work, but that might not be enough to impress your boss and get him to adopt flexible work options for your staff. Maybe he wants to know how flex will affect him financially. So this is when you whip out the numbers that show how a telecommuting workforce is a huge financial gain for him—and the company. It’s estimated that per every telecommuting employee, a company stands to save over $11,000 annually. Not possible, he says? Ask him to calculate reduced (or eliminated) office costs, not having to pay for computers, printers, and other office equipment. Have him factor in extra office expenses, such as the staggering costs of electrical usage and office supplies, like printer paper, ink, and other expenses. Multiple that amount by the total number of employees who can work remotely and it’s easy to see that the savings can be quite substantial. Car breaks down. A sick child. A snowstorm of the century. There are a myriad of reasons why employees can’t come in to work. All of those sick or personal days can cost a company in lost productivity. But work flexibility improves disaster preparedness. When an employee can work flexibly (i.e., starting and stopping his day based on both his professional and personal needs), an interesting thing happens—work continues to get done. There are no gaps in productivity; work goes on as usual despite your employee having to take his aging parent to the doctor or attend his child’s dance recital. In fact, quite the opposite happens: productivity improves, as does employee engagement, which then translates into higher retention rates—all because employees are happier with their jobs (and their work-life balance). On top of that, hiring is not limited to local talent; remote employers can have their pick of top-tier talent from anywhere in the world! All of these factors help increase a company’s bottom line and build a stronger, more invested, and loyal workforce. Convincing your company’s leadership to embrace flexible work options might feel like an uphill battle, but it’s important to keep fighting. The massive benefits, from financial to being able to build the best workforce possible, means that remote work is a smart business decision that your employer should make now!